Yesterfood : Announcing Our New Party! Happy New Year to all my friends! What better way to start the new year than with a party? 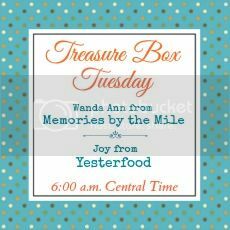 Wanda Ann from Memories by the Mile and I are very excited to announce our brand new party, "Treasure Box Tuesday!" It will be a great new place to see and be seen. Bring recipes, crafts, DIY....whatever family-friendly posts you want to share. Wanda Ann's popular Tuesday Trivia party will be ending, and transitioning into this one. We would love to see you for the very first Treasure Box Tuesday starting this Tuesday, January 7th, at 6:00 a.m. Central Time. Please put us on your calendars, and add our button to your sidebar or party page if you'd like. How Exciting, Joy!! Happy New Year!! I'll be sure to come and link up with you and Wanda Ann!! I can't think of a better way to start the New Year, more chances for me to come visit you!!! What a fun new party, Joy! Happy New Year to you! I can't wait :) You know I'll be there!! Hoping your weekend is great! Awesome! I'll put mark it so I can join up.